When your organization undergoes major change, most often your brand identity needs to undergo change as well. Otherwise, the core of your brand is out of alignment with the promise you make to your market, and a brand credibility crisis is likely to follow. Likewise, when your market (the reason for your brand’s being) undergoes major change, your brand probably needs to change, too. Otherwise your image is out of sync with market needs, tastes, and desires, and a brand relevance crisis is likely to follow. In the race to roll out new products, seize new opportunities, open additional outlets, add new distribution channels, or expand into new market areas, your business can outgrow your brand identity. Suddenly, your core brand message is outdated, you can no longer keep your brand promise, and your brand experience is unpredictable. If your organization has experienced dramatic growth in the most recent six-month period, schedule a retreat — soon — to evaluate whether your brand identity still reflects the character, values, and attributes of your evolving business situation. Don’t wait until an identity or credibility crisis sets in. The marketplace is in flux. Digital communications have upended how businesses communicate, present offerings, and even sell products. At the same time, market territories, even for small businesses, have expanded almost without limits. Even self-employed freelancers in home offices can now serve market areas that span the globe. Amidst this change, brand owners refocus or change strategic direction — and brand identities — to adapt to their changing environments. Among the examples are businesses that have moved their bricks-and-mortar businesses online; businesses that have shifted emphasis to address environmental realities; and companies that have altered product lines, distribution approaches, and business strategies to serve global markets. UPS is a case in point. Over the past decade, UPS shifted its emphasis from fleets of delivery trucks to teams of global logistics experts. In the process, the company changed its marketing message, redesigned its logo and website, and developed a new tagline to address the company’s changed structure and market. In the 1990s, UPS marketed under the slogan, “The package delivery company more companies count on.” Today, the company presents itself as “a leading global provider of specialized transportation and logistics services,” eliminating reference to packages and shipping, instead opening the consumer’s mind to the company’s expanded market and capabilities. When you hear the word merger, most often you’re hearing a euphemism for the reality that one business has been acquired or taken over by another. On occasion, two businesses participate as 50-50 partners in a merger, but even then one company usually emerges as the dominant force. Whether companies are acquired or merge, their brands rarely blend into one. Essentially, a brand is an organization’s promise. If merged brands try to merge promises, most often they end up with a two-pronged promise that confuses consumers and rattles confidence. The acquiring or dominant company keeps its name. It emerges as the prevailing brand, often with a revitalized identity to reflect the benefits of the merger. The seller’s name prevails. For example, when SBC acquired AT&T, it adopted the high-value AT&T name and updated the identity to appear more agile and youthful. Changes included a redesign of the brandmark to more closely resemble a globe — the market served by the new entity. The combined brands merge their names. This solution works but only once in a while. For example, FedEx acquired Kinko’s and announced the new brand name FedEx Kinko’s, but within years the merged entity was renamed FedEx Office. A new brand name emerges with no apparent link to either of the merged brands. For example, the name Verizon emerged from the merger, way back when, of Bell Atlantic and GTE. In the low-budget start-up days, many businesses resort to brand identities that are either self-designed or whipped up by an aspiring artist recommended by the friend of a friend. The result is usually a make-do identity created with all the best intentions in the world at a price that seemed right at the time. Fast-forward several years, though, and what seemed to work fine at startup no longer represents the culture or sophistication of the organization or fits the nature of the market it serves or the environment in which it survives. Assess how much you want or need to change your identity. Brand identity redesigns span the gamut from evolutionary to revolutionary depending on whether they move the current identity forward a little, a lot, or into an altogether new name and logo. 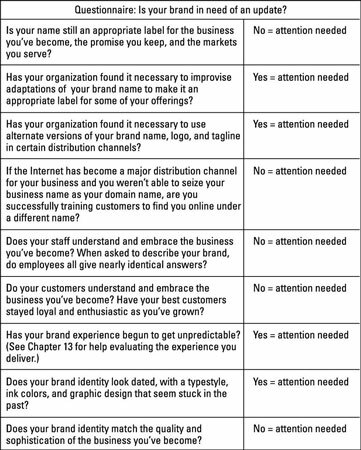 Determine the brand identity assets that contribute the most value to your brand. Assess and identify which identifying elements have the greatest marketplace awareness and affection so you know which aspects to protect and carry over to your revitalized identity. Invest in the counsel and talents of a good brand designer as you weigh your existing brand strengths and consider your options. Adopt a revitalized brand strategy that can represent your brand vision for at least ten years, which is about the maximum frequency that the look of a brand should undergo major change.